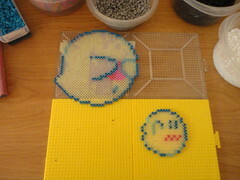 Pixelating projects,one bead at a time. 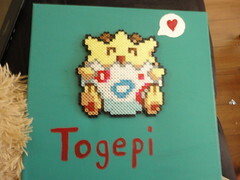 Perler beading is something that people are unaware of the possibilities of it. It really can span a large area of the world of art. Recently, I have started working on my own pieces and trying to expand my knowledge, understanding and talent. I usually just did the beading itself and tacked it to the wall. 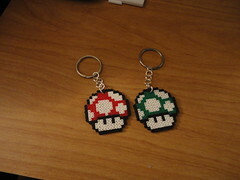 Now I have begun to make necklaces,painting and key chains. 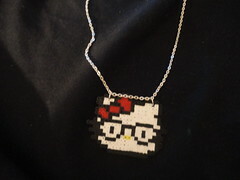 Here are some of the necklaces/keychains I have made. 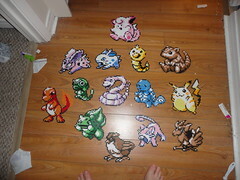 All of these were made with mini beads. 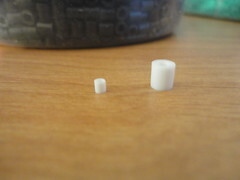 Mini beads are 1/4 the size of regular beads. 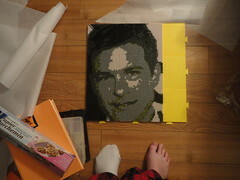 When I use the normal beads, I do so with my hands. However mini beads require me to use a needle or a tack because the same of them is just too small. One thing I did learn is that where ever you are going to put the hoops, you need to take out the beads. I didn't do that with the one from the last picture. It was a royal pain to get the hoops to go in. After some practice, my ironing with mini beads has gotten better. I have to turn down the heat quite a bit and do something called flat ironing, which has no holes throughout the piece. These are the three pieces I have done. 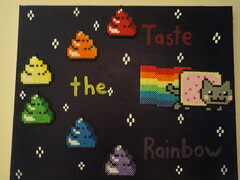 I am not a skilled painter in the least. I do have to say, I am quite pleased with how they all turned out. The Big Apple one bugs me a bit just because the writing isn't straight. 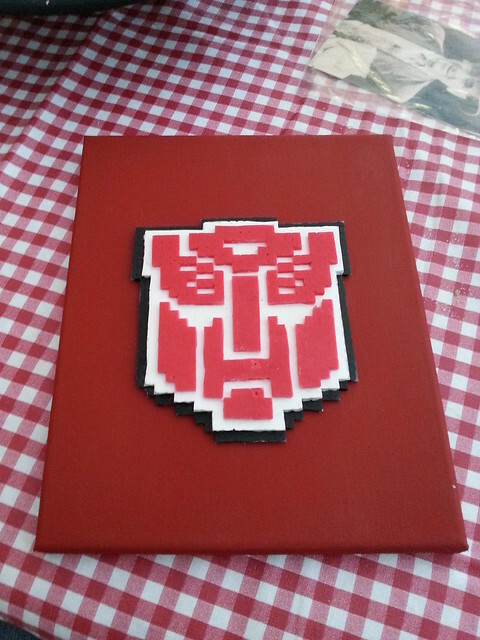 However, it was my first time painting so I will take it as a learning curve. Now, here is where I am going to give some shoutouts to other people on their mixed media style. It really amazes me on what people can do. These are from EEK Creations. 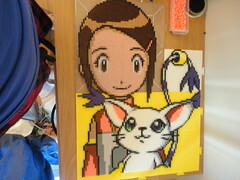 She is one of the most talented people in mixed media with bead art(as well as other art). Please check out her facebook page and be in AWE of her just like I am. This was made by a friend of mine Jake. 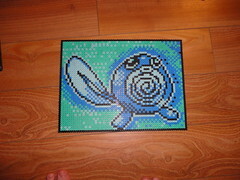 It is one of the coolest effects I have seen with beads. 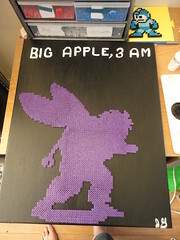 It's 3 layers of flat ironed beads, glued together and placed on canvas. We call it the Rumble Effect(an inside joke of sorts). It makes me wish I could find something cool to layer like that. Ok, this one isn't a mixed media but it needs to be seen by a lot of people. 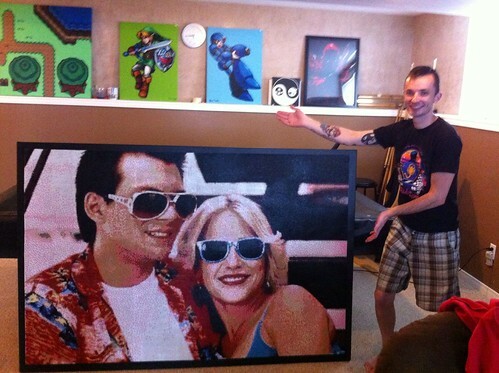 This is ALL beads! It's massive and awesome. This was done by a guy who goes by the alias "ShampooTeacher". He says it took him about 130 hours to bead and iron. If your jaw doesn't drop at this, I would be shocked. Well folks, that is all she wrote. I'm sure you all thought I disappeared forever and I thought I would have too. It's been so long since I wrote anything on this blog and I'm posting now because people have been bugging me about it. So long time no see everyone :D. Glad to be back. It's been a crazy year so far for me. Work has been keeping me busy along with regular life stuff.Had my braces taken off in January was very exciting for me. Being on vacation for 2 weeks and having a friend visiting kept me even more busy. So beading has almost taken a back seat to everything else in my life. So today, it's going to be a quick photo dump with all the projects I have done and then something at the end so please read on :D.
Now here is the part for you guys. What do you want to see on my blog? I really don't exactly what else I should post. So post a comment, ask anything and next post I will reply to all the comments. I have mentioned on this blog that I buy from a woman named Michelle Baker. 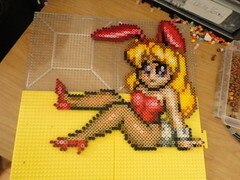 She's fast, easy, cheap and getting beads from her is the best way to go in regards to pricing. 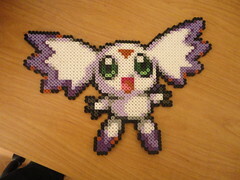 Now, in my pervious post, I mentioned mini beads. This week Michelle announced that she is selling mini beads. The prices are for 2k beads single colors: $2.75 each + shipping. I am sorry, but I cannot split these as they are too tiny. 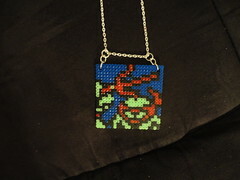 The Large mini linkable square is $6 each + shipping. Thanks for all those that have asked for these. They have been a long time in the making. I have to special order them from Denmark and they take like 4-6 weeks to arrive and I can only place an order about 2-3 times per year. I take PayPal as payment. Please be sure to send your address when you place an order so that I can better determine the shipping cost and have a quicker turn around time on your price quote. So i hope this info is good news for anyone. Next post, showing off my Christmas commissions and projects. Halloween is fast approaching and I am really surprised that time has gone by so fast. It feels like just the other week it was my birthday. I have been beading quite a bit lately and I have a lot to share with you all. 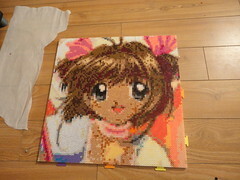 About a month or so ago, I managed to get a hold of something called Hama mini beads. Now the normal beads can see very small to some people but they are nothing in compared to mini beads. Now you see the difference. 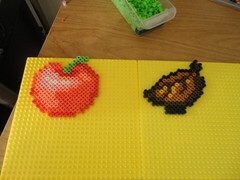 The one on the right is the regular one and the one on the left is the mini bead. It's insane how tiny they are. I use a tack just to bead with them. 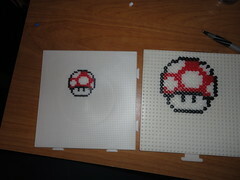 These are two Mario mushrooms so you can really see the size difference when it comes to sprites. I look forward to more work with mini beads. They are so much easier to make necklaces with. So the other week, I was testing out a blacklight bulb for some stuff for work. 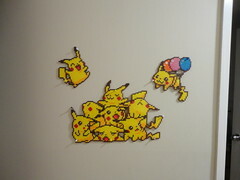 I turn around to see my wall by my bed glowing. I LOVE my bedroom wall now. 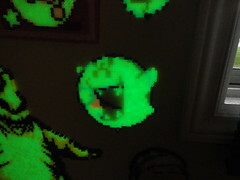 I have yet to take the blacklight out of my bedside lamp. 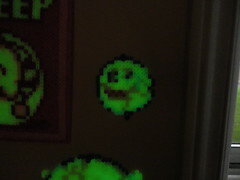 Glow in the dark beads are great under a blacklight. 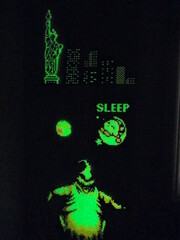 Now I have posted before about pieces done by Gallio from PixelGasm. Well he has yet again managed to outdo himself. He made these really cool ghosts that in day light look one way and at night glow a different ghost. He was nice enough to share the patterns with me so I could make them. I made this portrait of Jason Bateman in anticipation of the Arrested Development Movie. I am a HUGE fan of Jason Bateman and will watch anything he is in. So this seemed appropriate to make. Well I have some commissions to work on for Christmas. So those will be posted once they are done. Happy Halloween Everyone.